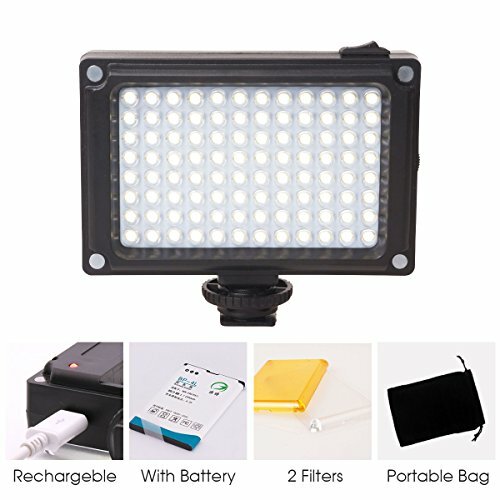 Rechargeble 96 LED Video Light,Ulanzi Pocket Mini on Camera Led Light with 2500mAh Battery and Magnet Filters for Sony Panasonic Canon Nikon DSLR Camcorder by Ulanzi at Video Camera Authority. MPN: UL-96. Hurry! Limited time offer. Offer valid only while supplies last. Ulanzi 96 LED Video Light is designed for DSLR Camera and it is able to light for phone. The New Upgraded ,can be charged directly by USB Cable. Ulanzi 96 LED Video Light is designed for DSLR Camera and it is able to light for phone. The New Upgraded ,can be charged directly by USB Cable. Come with 2500mAh Battery and USB Cable. It is in a small body and easy to take in pocket. The switch button is indepent. So its brightness can be remembered like last time . It is very convenient to finish last photography task. It is a Quality Pefect Light for Your Photography and Videography, and with Best Price with Battery Together ,Just Add to Cart.